MAXI09 incorporates a keyboard controller implemented in C and utilising an ATMega8515 AVR MCU, with an attached Amiga 600 keyboard matrix. The linkage to the rest of the computer is via a bi-directional UART port (Port C on MAXI09’s Quad UART). The controller is fairly complete, with debounced matrix scanning and configurable key repeat. 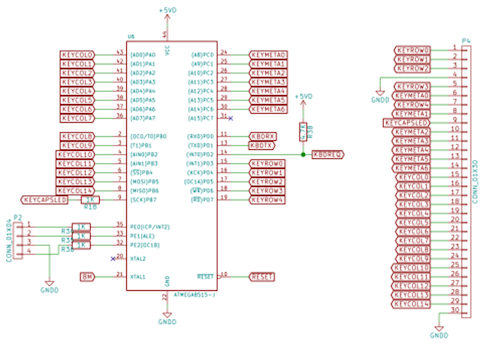 As well as the keyboard matrix, the AVR has attached to it an RGB LED for showing general system status information. This LED is controlled via commands sent from the host processor. The AVR can also generate a signal on one of the MAXI09 FPGAs. This is intended to trigger an NMI or system reset on a particular key combination, though this is not yet implemented at either end. Doubtless it is not useful to anyone else, but is documented in the hope that someone either learns something from my work or helps me improve my code. The Amiga 600 has a “standard” Amiga keyboard, but without the numeric keypad. A schematic for the Amiga 600 is available here as a PDF. The last page shows the pinout of the keyboard flex connector, along with the arrangement of the matrix itself. This shows the linkage between the AVR and the keyboard flex connector. Mappings from the scancode to the labeled key marking would be great, but I have not yet produced such a list, save for the 6809 code which translates the scancode to ASCII. The COM_TYPE_DELAY and COM_TYPE_RATE set the typematic delay and typematic rate values; the time taken for a key repeat to start after the first key press, and the rate at which keys will subsequently repeat. The “x” values give a range of 0 to 63, which is in units of 4ms. The default values are 200 and 100ms respectively. The rest of the commands are self-explanatory. Note that no acknowledgement of a command is currently given.